Pink Floyd drummer Nick Mason will perform vintage material by the legendary UK band on a spring 2019 UK tour. 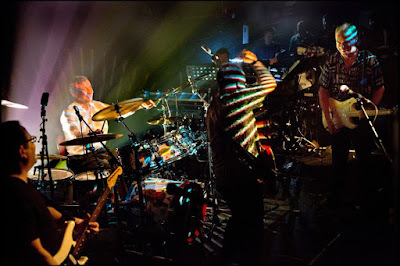 Currently set to wrap up a fall European and UK trek with his band, Saucerful Of Secrets, this weekend, Mason has announced a spring series of five UK dates that will begin in Cardiff next April and end with two nights at The Roundhouse in London. Tickets for the new shows will go on sale Friday, September 28 at 10 AM local time via thesaucerfulofsecrets.com. The drummer recently released a box set collection of his solo albums entitled “Unattended Luggage”; the limited-edition offering compiles the rocker’s 1981 release, “Nick Mason's Fictitious Sports,” 1985’s “Profiles” and 1987’s “White Of The Eye” soundtrack in both 3CD and 3LP vinyl packages for the first time in over 20 years.